The Deputy Prime Minister, Nick Clegg will tonight be joined by celebrity campaigners, religious figures, activists, charities and politicians as he hosts a reception to celebrate the Government’s historic consultation on equal marriage. 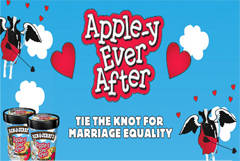 Guests will served Ben and Jerry’s ‘Appley Ever After’ ice cream, specially renamed by the company in support of equal marriage and will be entertained by Diversity, London’s only gay, bisexual and transgender community chamber choir. The Government’s consultation on equal marriage was published on 14 June this year. The Government will respond by the end of the year. “Continued trouble in the economy gives the bigots a stick to beat us with, as they demand we “postpone” the equalities agenda in order to deal with “the things people really care about”. As if pursuing greater equality and fixing the economy simply cannot happen at once. Communications (Cabinet Office) would like to recall the message, “Deputy Prime Minister Equal Marriage reception this evening”. With apologies, please see corrected text below. The last version you received was incorrect and sent to you in error. Please only quote from the text below. “Continued trouble in the economy leads some people to demand we “postpone” the equalities agenda in order to deal with “the things people really care about”. As if pursuing greater equality and fixing the economy simply cannot happen at once. That plan seems to have gone well. Surely not a pre-conference attention grabber?